High-level defence talks will be held between Indian and Russian officials in New Delhi this week, mainly focussing on the maintenance of India’s Russian-made arms and ammunitions. 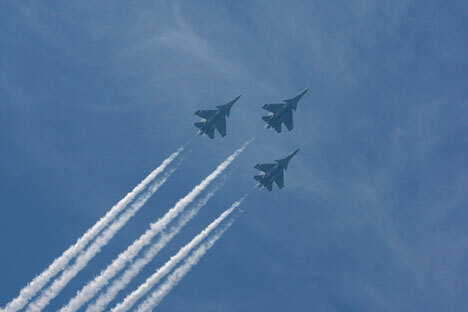 Officials from Russia and India will discuss the upgradation of the radar of the Su-30 MKI, one of the most advanced fighter jets of the Indian Air Force (IAF), the Deccan Herald reported on its website. The officials will meet in Delhi on June 5-6, the paper added. The Indian delegation will be headed by Defence Secretary R K Mathur and will have representatives from the India army, navy and air force, according to the report, which added that the Russian side will have representatives of the military industry and the government. Problems related to maintenance of Russian arms and ammunition will be discussed at the meetings. The Deccan Herald added that the discussions come in the wake of Hindustan Aeronautics Limited saying there are critical problems in some of the Su-30 mission computers and head-up display systems. A HAL official had informed Irkut Corporation on multiple cases of “repeated failure of mission computer,” the paper said, adding that the head up display multi-function display too were blanked off in flight. Such problems were visible in two configurations of the aircraft. HAL Chairman R K Tyagi told the paper that “very few aircraft reported the problem of mission computer failure and blanking-off HUD which was of initial batch.” He added, “The issue was intermittent in nature and related to old software version. The issue has been addressed by upgrading the software version by Russian side and by replacement of the mission computer and head up display wherever they have been found un-serviceable during ground checks. Till date no such incidence has been reported from any IAF base with upgraded software version. Sources tell RIR that the potential sale of Mi-35 helicopters to Pakistan will be taken up India’s defence secretary during the talks. Several media outlets reported that Russia lifted its embargo on sales of military equipment to India’s neighbour. Yesterday, the Rostec Chief Executive Sergei Chemezov clarified that there was no such ban in the first place. While a deal between Russia and Pakistan is not imminent, sources tell RIR that Moscow is merely looking at leveraging bargaining power with Delhi in future negotiations. “Russia will not risk the future of defence ties with India over one contract with Pakistan,” a source told RIR. “But if India can justify defence ties with the West and speak of national interests, what’s to stop the Russians,” the source close to this week’s defence talks in Delhi, added.